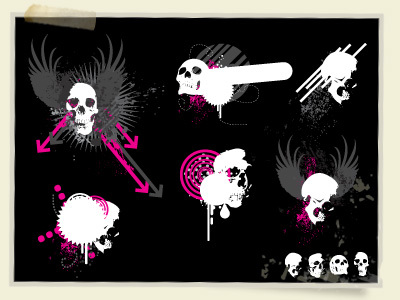 This set of free vector skulls will give everyone an opportunity to get a little punk rock. Skulls like this can be great little accents to a montage masterpiece or the vocal point of your work. So put on some Misfits and use these free vector skulls in any way you see fit. Take a design risk and do something unique and interesting! Well this has Ben Blogged! Hey i tried to have a little fun with your free stuff and i posted it in my blog..
Hi, i have used a part of your free vector skulls. You can see it on my website ! I have credit you. Thanx. (sorry my english is bad). Do you have Illustrator or Photoshop? i got a sk8 board and stuff and i put skulls on it sweet!!!!!!!!!!!!!!!!!!!!!!!!!!!!!!!!!!!!!! i dont know about skulls their kind of scary looking!lol!im kiding skulls are amazing!!!!!!!!!!!!!!!!!! woooow so great. i used the skulls für some shirts too in different colours u cam see them on my website. many many thanks from germany. the elements are sooo great. Hi! Can these skulls be used in commercial projects too? I could use them on a e-commerce website if its OK Looks great! Please let me know, thanks!! Go for it! Would love to see the finished project.